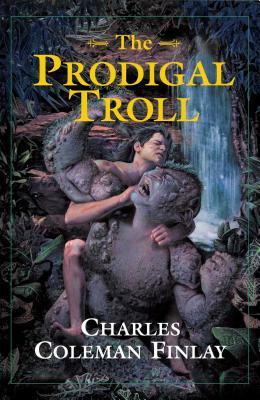 The Prodigal Troll is a tale of a human child raised by a band of mythological creatures that is both hysterical and moving. When Lord Gruethrist's castle is laid under siege by an invading baron, he sends a trusted knight and nursemaid off with his infant son. Their escape across a wilderness landscape populated by fantastic creatures and torn by war takes unexpected turns until the baby is finally adopted by a mother troll grieving for her own lost child. Christened "Maggot" by a hostile stepfather, the human boy grows up amid the crude but democratic trolls until he leaves the band to rediscover the world of humankind. But the world of man is a complex and capricious place. Maggot must master its strange ways if he is to survive... let alone win the heart and hand of the Lady Portia. Finlay's society of trolls are unlike any you've ever read before, and his matriarchal medieval world, pitted as they are against an analog of Native American tribesmen, provides a rich setting for many poignant social and political insights. From the Trade Paperback edition. Charles Coleman Finlay: A two-time winner of the British Fantasy Award, Mark Chadbourn is the critically acclaimed author of eleven novels and one nonfiction book. A former journalist, he is now a screenwriter for BBC television drama. His other jobs have included running an independent record company, managing rock bands, working on a production line, and as an engineer's "mate." He lives in a forest in the English Midlands. Visit Mark Chadbourn's Web site at www.markchadbourn.net.